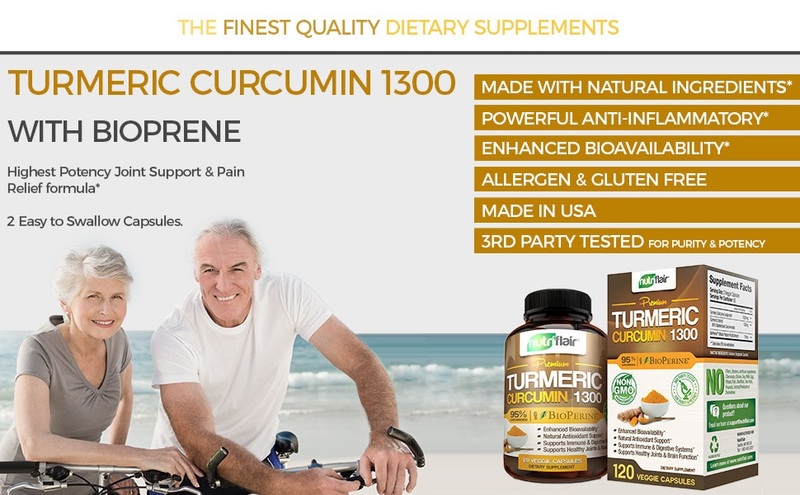 Put an end to joint pain and discomfort with our turmeric curcumin with Bioperine supplement! Ageing causes our bodies to break down naturally. It may make it difficult for your knees, hips, and other joints to function properly and lead to pain and a number of uncomfortable symptoms. Here at NutriFlair, we believe you deserve an active lifestyle that’s free of joint pain and discomfort. That’s why we offer a turmeric curcumin with Bioperine supplement. This supplement offers antioxidant and anti-inflammatory properties that ease joint pain and inflammation while supporting overall health. Whether you’re a man, woman, or senior, you can reap the benefits of our unique turmeric curcumin formula with Bioperine. Since these capsules contain 95% standardized curcuminoids, you can enjoy real results. You’ll find that in addition to healthier joints, you may improve your memory, enhance your immune and nervous systems, and boost your mood. This product was third-party tested and does not feature any hormones or preservatives to offer you the very best results. Due to the fact that we are firm believers in our turmeric curcumin with Bioperine product, we are pleased to offer a 60-day 100% money-back guarantee. In the event you are not satisfied for any reason, simply return the empty bottle and receive a full refund. No questions asked. What are you waiting for? Add our turmeric curcumin with the Bioperine supplement to your cart today!